MIDImix by name, MIDI mixer by nature. MUSIKMESSE 2015: Akai's new MIDImix is a pretty simple proposition, but we suspect that it could prove to be rather popular. It is, as its name suggests, a MIDI mixer, designed to give you tactile control of your DAW mixer's controls. There are eight line faders, a master fader, 24 knobs (that's three per channel) and eight buttons in two banks to provide mute, solo and record arm functionality on each channel. Other features include the option to send all mixer settings to your DAW by pressing a single button and 1 to 1 mapping with Ableton Live (Live Lite comes in the box). Commenting on the launch, Akai Professional Product Manager Dan Gill said, "We are particularly excited to introduce the MIDImix, because up until now, there was just no solution for musicians and producers who needed a compact, easily-portable way to mix and process their projects on site. "Simply put, this is the best solution for portable mixing on the go. MIDImix offers an intuitive,familiar mixer layout, solid connectivity with the most popular DAWs, and legendary AkaiProfessional quality. MIDImix is exactly what people have been asking for." 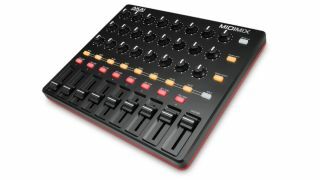 MIDImix will be available in June priced at £60. Find out more on the Akai website.